Since the end of our league season, my u14 side have been using training to prepare for upcoming small sided tournaments, beginning with a 5 a side competition. This article will detail our preparations for said 5 a side. Within small sided football games, the level of individual responsibility is heightened, particularly in defence. Furthermore, the small pitch sizes make almost every zone and player on the pitch potentially dangerous in the immediate future. In addition, many of these tournaments operate without an offside rule. The combination of these factors makes man-marking extremely common, and logical, in 5 a side football. Partly due to this man-marking and the low number of players, 5 a side teams are often very dynamic positionally when attacking. Firstly, I chose to play in a diamond shape, since it could have advantages against man-marking or more zonal approaches. Against man-marking, starting in a diamond as opposed to a 2-2 means the opponent will leave more space in depth and width for us to run into. Furthermore, the likelihood of man-marking will imply the necessity of playing into the strikers’ feet, and playing lay-offs from there. The diamond shape should theoretically provide lay-off options to either side for the central forward. If a team defends in a more zonal 2-2 approach, the diamond has natural spacing advantages with each player being positioned between 2 opponents. This would heighten the chance of miscommunication amongst the opponents. The one forward could position themself between the opponents’ two defenders, the wide players are initially free between the defender and forward on their side. The central defender meanwhile has 3 options with which to manipulate the opposition strikers. If the opponents’ strikers were to start wide, pressing whilst using their cover shadows to prevent the pass into the wingers, he could have the clear option of playing into the strikers’ feet. Alternately, if one or both of the opposition strikers defend particularly narrow, the pass into one or both of the wide players would be open. Our main method of attacking against man-marking was to be 3rd man runs from deep into depth. Not only is this a generally effective way of creating advantages in these situations, it suits our players since we have wide players with a strong sense for timing runs in behind. Furthermore, this fits with our diamond shape since we have players starting wide on either side who could potentially make such runs. Of course, once the analysis was done and the resulting model was decided upon, the next step was how to coach it. I devised a dynamic 4v2 rondo, to replicate aspects of 5 a side games, and aspects of our model. 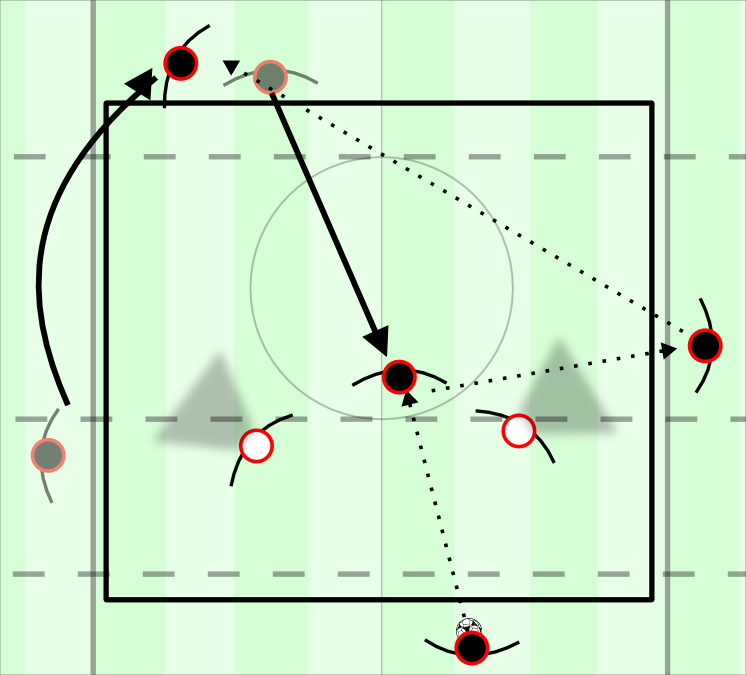 In this drill, the aim is to get the ball from one end to the other, however there must be at least one pass into and then from the inside of the square in the process. The point for successfully transferring the ball to the opposite end, will only count if there is a player on both ends of the square. This is to ensure that in the process of attacking, the team has at least one player back to defend against counters. 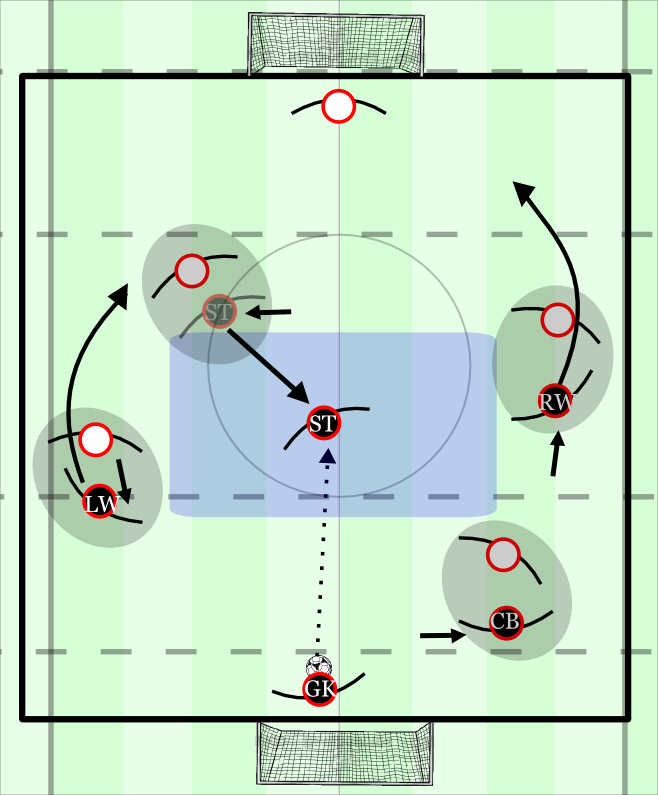 The rules force the outside players to be dynamic and constantly react to each other’s movements. Crucially though, they have to react to the defenders’ coverage for both movement and pass selection. If the 2 defenders block the inside, the onus will be on one of the wide players to come infield slightly and receive. If the 2 defenders block the wide players, the striker will have to drop and the team nates will have to react to this movement. Reaching the target is particularly interesting when the opponents block the outside. If the striker drops, one of the wide players will have to move to fill the end line dynamically. As such, 3rd man runs are trained as a way to break past the opponent. This is of course a very useful tool against man-marking. One coaching point I used was the idea of “positional pairs”. The deepest player would be paired with the highest player, whilst the wide players would also be paired. The instruction was to occupy a diagonal position from the positional pair. This gives a pendulum type movement of the diamond, which would often appear like a rhombus. With this positioning, the spacing remains like before, but crucially, the centre back can potentially receive passes from the goalkeeper with a forwards facing field of vision. Furthermore, it gives slightly more balance against turnovers with one of the wide players tasked with staying slightly deeper. We also used a number of conditions within our training session matches to promote certain behaviours. The most prominent condition was to play within a hexagonal field. There were a number of reasons behind the use of the hexagon field. Firstly, it would implicitly promote non-linear circulation. From the widest points of the field, the ball has to move back into the centre since the corners of a regular pitch have been taken away. This was also important in the context of an issue identified during earlier sessions, where the players had their options reduced dramatically by keeping the ball too long in the same area (particularly on the wings). The combination of the field shape and the diamond structure encourages passes into the central forward. Passing into the centre forward’s feet is the key to manipulating the opponents’ structure, significantly altering both the positioning and field of vision of all opponents. Additionally, the pass into the central striker triggers the 3rd man movement that we worked on in the dynamic 4v2 rondo. In response to this pass (or the central striker dropping), the nearest wide player runs into depth behind the striker. This creates a dilemma for the pressing centre back; press the dropping striker or drop off to defend the runner. The pass selection/decision will depend on the decision the defender chooses. I also used a hexagonal field shape for the effects on the wide players’ movement. 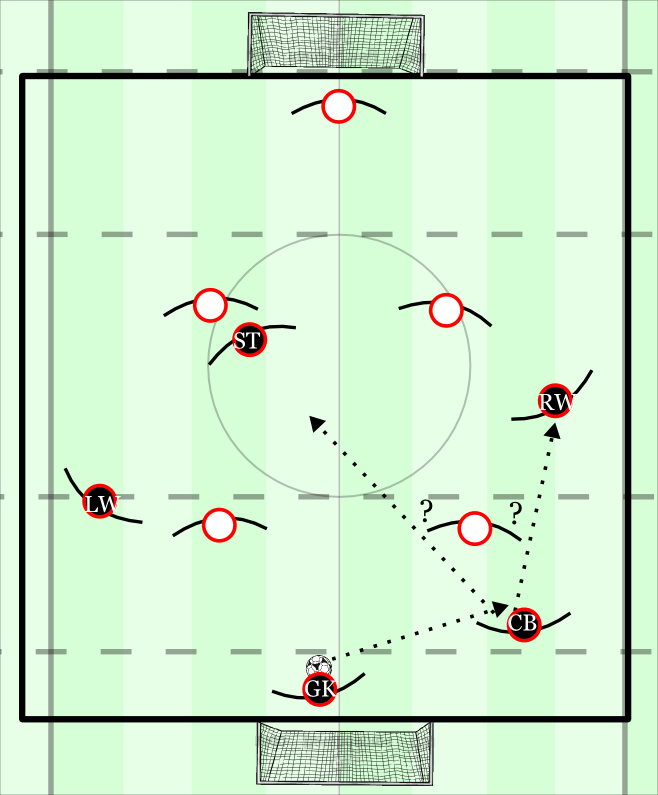 From the widest point in the field, the wingers are forced to make diagonal runs infield to attack further. This implicitly promotes the 3rd man movements from the wingers that are so central to our model in attack. 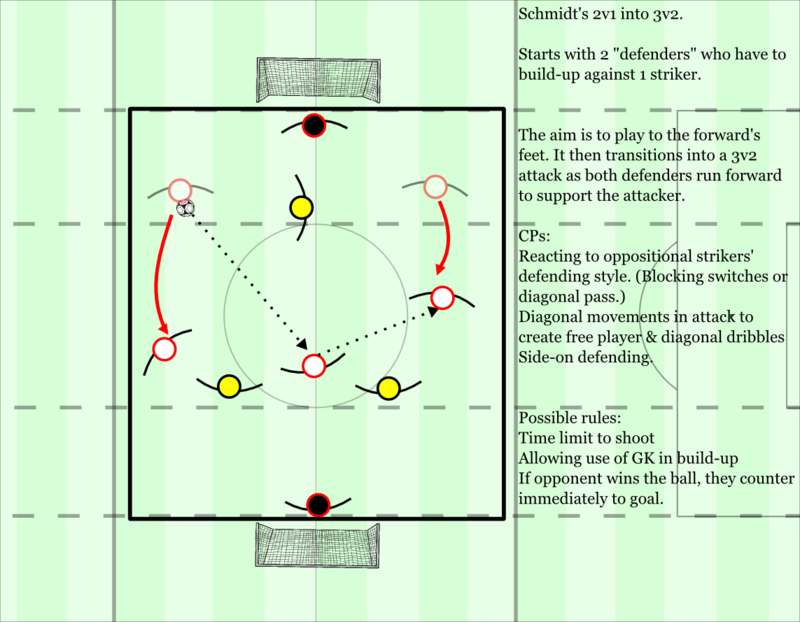 Another important exercise I used was Roger Schmidt’s 2v1 into 3v2 attacking drill. Initially the attacking sides goalkeeper feeds the ball into one of the centre backs, they must then progress from the 2v1 situation by finding a pass into the striker. After passing to the striker, the two centre backs run forwards to create a 3v2 situation where they can offer themselves for lay-offs from the striker and attack goal. With both teams possessing equal numbers, this can of course be replicated in both directions. This trained a number of aspects from the model. The offensive defenders (defenders with the ball) have to learn to make accurate passes to the feet of the striker. The offensive striker has to learn to receive and secure the ball with pressure from the defenders behind them. Furthermore, the timing of runs from deep by the defenders is an integral aspect to perform the exercise well. They are key to either give the striker time to turn, or an option to lay it off depending on the decision of the opponents’ defenders. This ties in to another vital aspect which is trained implicitly. The receiving striker has to perceive the decision of the defenders around him, as this will dictate whether they can turn and dribble into space, or have to lay the ball off to a runner. I used some explicit methods to reinforce the behaviours promoted within our training drills. This revolved mainly around preparing some visual aids with short explanations to prompt the players, and further reinforce the aspects of our model. Using this image, I reminded the centre back to manipulate the opponents’ first presser with the two nearby options. His selection of the pass, or dribble route, to take will depend on the decision of the first presser. If the first presser approaches whilst blocking the centre, the nearby winger should be able to receive. In the unlikely event that the first presser blocks the outside pass first, the pass into the striker will be open. Here, I reminded the striker to drop into the central space if the opponents were man-marking tightly. The ball-far winger is encouraged to make a curved run into depth immediately. The winger’s original marker shouldn’t be able to track the run fully, due to a dynamic disadvantage. Therefore, the striker’s original marker should be forced into a decision, to follow the dropping striker or cover the running winger. The ball-far winger was prompted to read the decision of the striker’s marker. If the striker is followed tightly, the ball-far winger should stay deep for a lay off to relieve the pressure. If the striker isn’t followed, the ball-far winger should also run forwards quickly. This will give further time for the striker to dribble forwards, and give an option for a through ball. This is some fantastic analysis of attacking in 5-a-side. How did you go about preparing defensively? Did you use a strong pressing game or did you sit back and allow opponents on to you? What is the state-of-the-art in Germany? Can you write something about it? Oh forgotten. What about an opponent which is constantly putting us under pressure in our half? My suggestion: GK – LW- CB-CB – RW as “shifting four” and the CF gambling for a counter. a) in a defending formation? b) in an attacking formation? I would prefer an additional central back keeping a diamond formation: GK – CB-CB – RW-LW- CF with the option to fill up the centre of the pitch, if there would be a vertical pass through the middle. Glad to hear the answers. In 6 a side, I used 2-1-2. I think the base positioning offers clear and valuable solutions to build-up situations. Without the ball I like using a 3-2, usually with the central player dropping between the 2 defenders.